Below is a top line summary of the different family models. 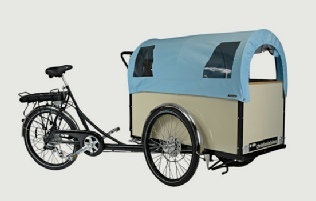 If you are interested in more information please email us on info@kidsandfamilycycles.co.uk or click on the link below to request our new Christiania Bikes summary. 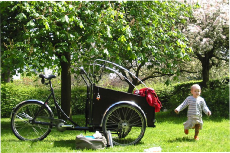 If you email us a description of what you want to do with your cargo bike and how many children you wish to carry, we can put together a personalised list of possible options for you to choose from, including prices. This model is one of the most popular for families and is lovely and light with a smooth pleasurable ride for all, and has been designed with families in mind. The selected materials are warm, user friendly, and the box has no sharp edges. Room for between 1-4 children depending on the model you choose. The children relish climbing aboard for a comfortable ride. 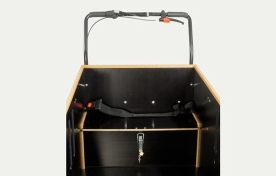 The seating is good quality, can have Y belts and is extremely sociable in it’s layout. 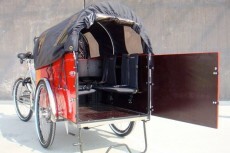 Generally it is fitted with 7 speed gears, has an aluminium frame and a rear coaster brake, but other options are available. 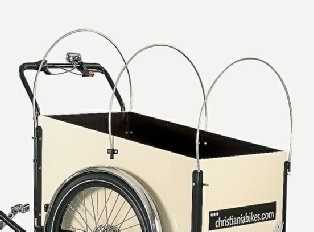 The Christiania Light rolls so smoothly and swiftly, it is just a pleasure to ride. 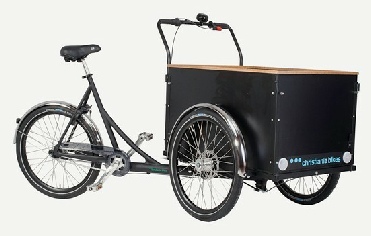 Fitted generally with seven speed and coaster brake (three and eight speed are also available), and with a tight turning circle, it is surprising manoeuvrable in most urban settings. 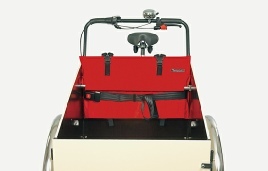 There is a range of box colours and canopy shapes and colours; see details below. Two choices of seats: a wooden bench, with optional pillow, or a soft seat; both are for two chldren and come standard with a lap-belt. 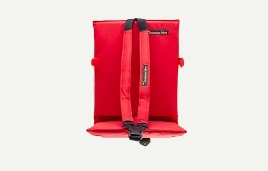 For children younger than two, an additional three-point harness can be fitted. Climbing on board is aided by an aluminium step. If you have three or four children (or if you plan to transport your children’s friends regularly), choose the straight option, so that an extra bench can be fitted. 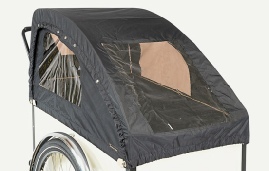 The Classic also comes with a steel frame: £90 cheaper but 5 kg. heavier (and no climbing step). 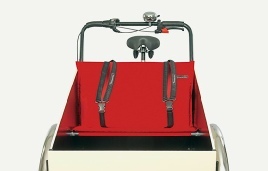 Christiania Bikes are an award winning cargo bike brand, with a truly iconic design and oozing with quality. 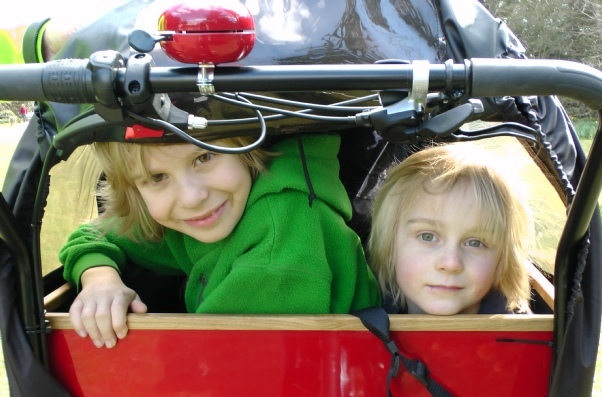 Annie and Lars have spent 30 years perfecting their craft and have created a superb range of Christiania cargo bikes and trikes. With quality components and finishes, these bikes are a dream to ride. So please don’t be misled by inferior copies. The extra pennies spent are worth it, especially when you are carrying precious cargo and you want to enjoy the ride too. 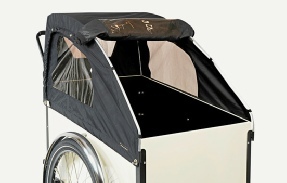 You will also benefit from a significantly higher resale value of a recognised quality brand if you ever want to part with your cargo bike. 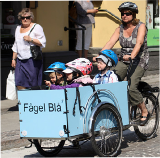 The Christiania is one of the best selling cargo bikes and trikes of all time, and the Danish know a thing about cycling. 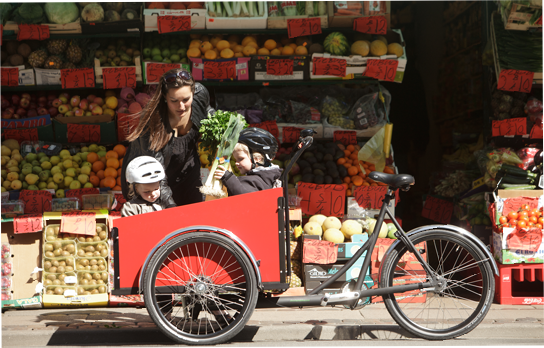 At Kids and Family Cycles we love helping families choose the right family cargo bike for your needs. Max load: max. 100 kg + driver. Box dimensions: 88 x 62 x 50/36 cm. Box: 9 mm waterproof plywood. Totalwidth: 87 cm. Totallength: 208 cm. Frontframe: Matt black coated aluminium. Rearframe: Matt black coated aluminium. The crank is aluminium, and the bearings are enclosed in cassette. Wheel: Black double-bottomed aluminum rims 24" x 1.75. Front hub is aluminium with deep groove ball-bearings. Brakes: Mechanic disc brakes on front wheels. Hand brake with included parking function. The Bugatti hood has an aerodynamic and flexible design. 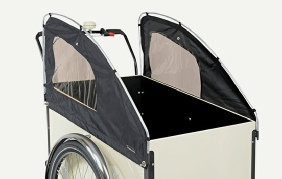 The top can be rolled up from front or rear and the sides can be opened. It has three panels: two sides with windows and a central one with a large front window and a rear window. It is mounted with 1 Bugatti arch along each side. 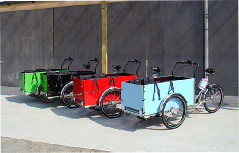 Suitable for: sloping boxes, straight boxes with 1 bench only and the Christiania bike 2 Wheeler. 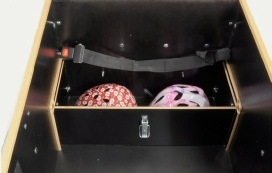 The Prairie hood fits the models with a sloping box. It can have 3 or 6 windows, 2 on each side and 1 in front. The hood is mounted with 2 hood arches. Available in black, red, light blue and cream.